JTNDaWZyYW1lJTIwc3JjJTNEJTIyaHR0cHMlM0ElMkYlMkZ3d3cucG9kb21hdGljLmNvbSUyRmVtYmVkJTJGaHRtbDUlMkZlcGlzb2RlJTJGODUwNDY4NCUzRnN0eWxlJTNEc21hbGwlMjZhbXAlM0JhdXRvcGxheSUzRHRydWUlMjIlMjBhbGxvd2Z1bGxzY3JlZW4lM0QlMjJ0cnVlJTIyJTIwc3R5bGUlM0QlMjJ3aWR0aCUzQSUyMDEwMCUyNSUzQiUyMGhlaWdodCUzQSUyMDk3cHglM0IlMjIlM0UlM0MlMkZpZnJhbWUlM0U= Ken covers the gamut in this week’s Boots In The Field Report including Rootworm and Japanese Beetles, Aphids, fungicide, low growth concerns, and spot checking your nitrogen program. Brad goes through how to check seed tube wear and how to ensure your row units are properly aligned. The concepts behind combine calibration and a guide to calibrating your yield monitor to ensure precise and accurate data. 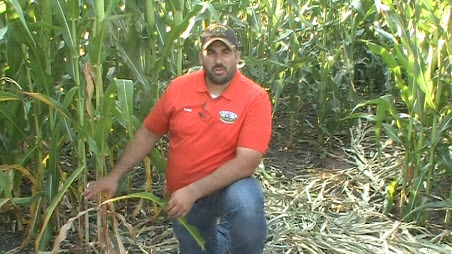 Crop-Tech Consulting agronomist Isaac Ferrie walks you through how to check your stalk quality to ensure standability, especially in a late harvest. Crop-Tech Consulting agronomist Isaac Ferrie discusses nitrogen deficiency and the relationship between nitrogen needs and population.